Bad Economics: Turning the corner - or is it really much worse than we thought? Turning the corner - or is it really much worse than we thought? George Osborne yesterday made a speech suggesting that the British economy had turned a corner and was now returning to growth – proving that the Coalition’s economic policies were working. The speech contained a sideswipe at the people – including the IMF – who had claimed that his economic assumptions were based on a misunderstanding of the multiplier effect of public expenditure and that his fiscal policies were damaging the economy (I blogged about the IMF work here). However, against the background of adulation from the UK’s corporate and license-funded media, a major paper suggesting that Osborne’s policies could be making things far worse has been causing some interest among more restrained and sober commentators. The paper, by Òscar Jordà of the San Francisco Fed and Alan Taylor of the University of California-Davis, backs the IMF view and suggests that the work on which Osborne has explicitly relied undersetimates the effects of cuts in public expenditure. The full paper is not easily available but a summary blogged by Professor Taylor gives a detailed outline. What makes this work significant is the methodological refinement which seeks to ensure that comparisons are made between economies with similar characteristics, rather than a taking a “one size fits all” approach to the analysis. Our results contrast with the expansionary austerity view of Alesina and Ardagna, and even amplify the opposing view of the IMF. For comparisons we have to adjust for the scale of the treatments by the average treatment size, the mean of the IMF measured consolidation (in % of GDP). There is little variation in treatment size across the bins, so the average treatment effects are in fact comparable to multipliers because the average treatment, coincidentally and conveniently, is close to one. 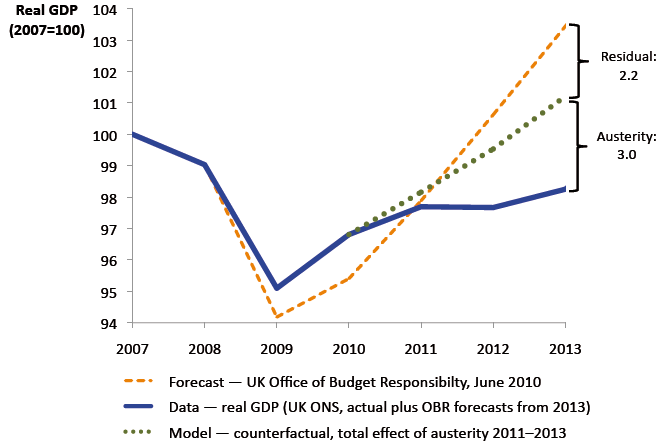 In recent times austerity has been systematically applied in weak economic conditions: plus ça change. But in a bad current state the economy is more likely to grow faster than trend going forward. By failing to allow for the endogeneity of treatment we could end up with a far too rosy view of the aftermath of fiscal consolidations. A dead cat bounces, regardless of whether it jumped or was pushed. Using ordinary-least-squares estimation we would walk away believing in expansionary austerity, or no effect when the economy is weak. Using ‘narrative’ instrument variables we might believe in contractionary austerity except when the economy is strong, but the estimates are possibly biased as the instruments may not be valid as allocation into treatment is not random. Using our two-stage method to deal with allocation bias, we find stronger evidence of contractionary austerity in the weak economy with much more precise estimates. These results suggest that only a strong economy can bear a fiscal consolidation without significant output losses. The message is clear. Far from allowing us to turn a corner – and there are strong grounds for arguing that the current UK economic recovery is nothing of the sort, but an aberration caused by the stoking of house-price inflation at a time when real incomes continue to fall and consumer prices continue to rise – Osborne’s austerity is doing long-term, as well as short-term damage. The authors concur with Keynes: austerity is something you do when the economy is booming. These are lessons that Ed Balls should be reading carefully. One of the points noted by Jorda and Adams is that fiscal stimulus is in principle more effective at a time when interest rates are at, or near, zero – an effect that, added to the simple fact that low interest rates lead to a benign environment for government borrowing, suggests that the Labour leadership’s current economic approach is deeply flawed. In other words, this is a terrible time for Ed Balls to be promising to stick to George Osborne’s SR2013 spending limits. Whatever the politics, there are clear signs that the hard macroeconomics points in precisely the opposite direction, and that Balls’ policy is both economically self-defeating as well as one likely to thwart a Labour government’s ambitions on vital standard-of-living issues like housing and health (it’s also worth noting that the economic fundamentals are entirely different to 1997, when Gordon Brown famously stuck to Tory spending limits in Labour’s first year in office, and paid down debt). This is one paper, although its influence is growing. But an ambitious Labour Party with aspirations to effect real change after 2015 surely cannot ignore the lessons it contains.